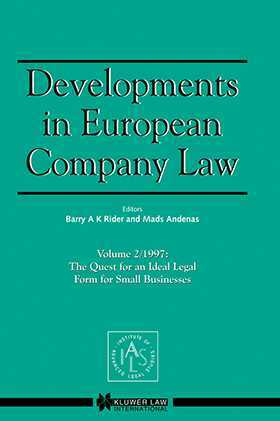 This second volume of Developments in European Company Law, published under the auspices of the Institute of Advanced Legal Studies' Centre for Corporate Law and Practice, focuses on the quest for a legal form for small businesses. The debate as to whether the traditional registered company, perhaps with some modification, is an appropriate vehicle for small enterprises has continued in Britain, and to a lesser extent in Europe, for well over thirty years. The imperative behind reform in this area of the law in many cases will be political and this is perhaps most dramatically illustrated in the case of South Africa. The British heritage of South African law renders South Africa's approach to developing appropriate legal forms for small enterprises of considerable interest to Europe. Consequently, the Institute of Advanced Legal Studies in collaboration with the Centre for Business Law of the University of the Orange Free State organised a conference in London in the Autumn of 1997 on the search for an ideal form for small businesses. The discussions were chaired by Professor A.J. Boyle and Professor Johan Henning and ranged across a broad spectrum of issues. In compiling this volume of presentations the editors have focused on those of most direct relevance to the debate in Europe and in particular in the United Kingdom, in keeping with the orientation of this series towards European Law.